After watching her on the reality tv shows The Hills and The City, I’ve been obsessed with Whitney Port. Her Los Angeles roots and her sweet personality has made her so memorable and so likable by everyone (well, maybe not Olivia Palermo). After her work at Teen Vogue, Diane von Furstenburg, and People’s Revolution, she’s been able to launch her own fashion line, Whitney Eve, which made it’s first debut at Lincoln Center for her Fall/Winter 2012 collection. Being able to show in two consecutive seasons at Lincoln Center is such a great opportunity for a young designer. Every seat was filled this season, leaving me pretty crowded in the standing section but I can’t complain considering this is my first Whitney Eve show after all. 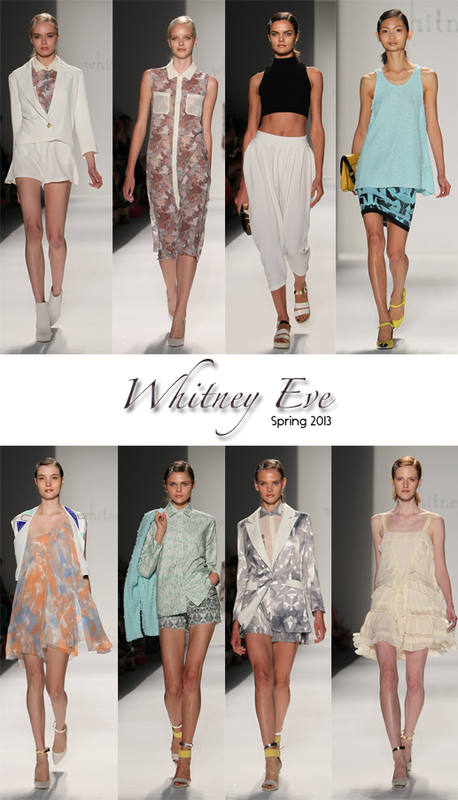 Fringe, bright colors, and fun prints were all over the runway so there’s no mistake that Whitney created this line. Her laid-back California influence definitely showed how wearable the clothes are. I could definitely see these pieces on someone, like you or me, down the street but still causing people to turn their heads. Following the last model of the final walk through was Whitney and a great cheer from the audience for the designer. It makes me smile seeing such a humble girl like Whitney live her dream at the biggest venue in New York City. This was a hard show for me to give away. I, much like Jennifer, am a huge fan of Whitney Eve. I've always liked her from her MTV shows as well. Even though she had turned me off with her PR stunt, asking for money so that she can show a second time at Lincoln Center. I was interested in seeing what she would show this season, but my "real" job got in the way. I couldn't be more thankfully for being involved with such an amazing blogging group (shout out to TBC) and that Jennifer was able to cover for me. Thank you Jennifer! Really nice collection. Good choice.